A wonderful healing has been given to us through your holy icon, O Sovereign Lady Theotokos. By its appearance we have been delivered from spiritual and physical ills, and from sorrowful circumstances. We therefore offer our thankful praise to you, O merciful Protectress. In his marvelous story with the same name Shmelev told one of the legends associated with “The Inexhaustible Cup” Icon, according to which a serf master named Ilia had painted this icon. The official history is silent about this, but it is this story that the wonderworking icon owes its fame, though, first of all, it is its miraculous power to heal alcoholism. In our troubled times, as it was a century ago, hundreds and thousands of people are flocking to Serpukhov and praying for healing. The gifts of the Christians who were healed from this sickness, their children and other family members, with which the pedestal of the icon is covered, are more precious than all golden settings. Today pilgrims are spreading the healing oil from icon lamps of the wonderworking icon along with the water which is blessed during prayer services all over Russia. And several centuries later this promise was fully fulfilled. By the end of the eighteenth century Vladychny Monastery was declining and decaying. The services all but stopped, the scanty brethren dispersed, and the churches were falling into ruin. However, Metropolitan Platon (Levshin; 1737-1812) of Moscow, through whose efforts the spiritual prosperity of the great Optina and other monasteries began, did not forget Vladychny Monastery either—it was near this monastery that he had spent his childhood. The metropolitan obtained the permission of emperor Alexander I (1777-1825) to re-establish this monastic community as a nunnery and in 1806 first nuns came to live there. A quarter of a century later, another great archpastor, Holy Hierarch Philaret (Drozdov; 1782-1867) of Moscow introduced the strict ancient rules of desert community life into the convent. Thus he restored the spirit of monastic disdain for riches (“nestyazhanye” – “non-acquisitiveness” in Russian) and providentially prepared the convent to receive such a holy shrine as “The Inexhaustible Cup” Icon. In the first year of the abbacy of Abbess Maria, namely in 1878, a peasant of the Tula province—a retired soldier who had a passion for alcohol for many years—in a vision saw a certain elder who commanded him to go to Serpukhov, to find the Icon “The Inexhaustible Cup” and to hold the a supplicatory prayer service before it. The old, penniless soldier, exhausted by his hard drinking, had absolutely no strength to go to Serpukhov. Soon the vision occurred again and the poor elderly soldier literally crawled to the convent on all fours. On the very first night of his ascetic journey the man suddenly felt that his legs began to obey him again. Reaching the convent, he put its nuns to confusion as they knew nothing of the icon with this name. 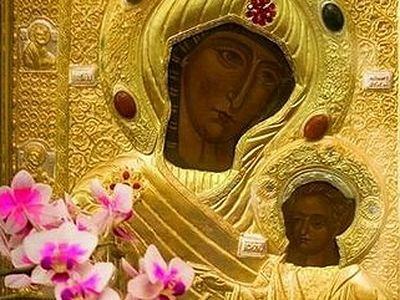 Then they remembered that an icon hung in one of the convent passages: on it the Infant Christ blesses the worshippers as if coming from a chalice for Communion; behind Him the Mother of God raises Her most pure hands—in the same manner as on icons of “The Sign”. Everybody was greatly amazed when they saw the inscription “The Inexhaustible Cup” on the back of the icon! Remarkably, when the man came up to the shrine of St. Varlaam, he at once recognized in him the holy elder who had appeared to him in the vision and commanded to go to the Mother of God for healing from alcoholism. The news of the wondrous miracle rapidly spread over many towns and villages: from everywhere those possessed with this terrible passion flocked to the miracle-working icon, venerated “The Inexhaustible Cup” and gave up drinking; thus peace and quiet began to reign in their homes—and all this was through the prayers of the Protectress of the mankind. The tradition of this miracle-working icon explains that, “The Inexhaustible Cup” is, according to the akathist, “the one who draws up joy from the source of immortality,” the source of consolation, healing, life and various spiritual gifts and happiness. And let everybody see the hidden spiritual meaning in the fact that “The Inexhaustible Cup” Icon became a source of saving hopes and cures from the wicked passion of alcoholism: the Mother of God is praying for every single sinner; She, the merciful one, knows the suffering of those who give themselves over to debauchery, knows how strong is the desire of many of them to rid themselves of this brutal vice, but cannot find strength to struggle. So the Most Pure Virgin reminds them through Her holy Icon “The Inexhaustible Cup” that She is the inexhaustible wellspring of grace and spiritual joy, that She pours out from Her ever-inexhaustible cup heavenly delight into their withered hearts; drinking of it, they will begin to hate that ruinous liquid which once invincibly attracted them to itself. 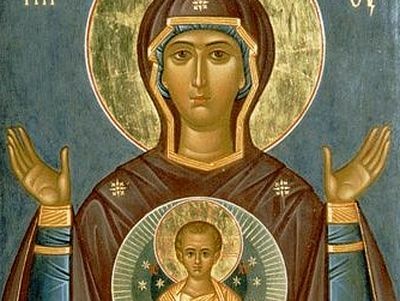 Such sufferers at any time and in every place should resort to the all-powerful intercession of the Most Pure Virgin, making it the rule to read the angelic salutation, “Theotokos Virgin, rejoice” at least three times a day. No matter how deeply rooted the cursed passion of drunkenness may be, it cannot withstand the gracious help of the Holy Theotokos. Today we faithful come to the divine and miraculous Icon of the Most Holy Theotokos, who fills the faithful from the Inexhaustible Cup of her mercy and shows them great miracles; and we who have seen them and heard of them rejoice in our heart and cry out, with deep feeling and devotion: O all-merciful sovereign Lady, heal our ills and our passions by praying to thy Son, Christ our God, that He may save our souls! Amen. Hieromonk Alexis (Trader) from Mt. Athos discusses impulse and addiction in patristic terms, and shows patristic parallels in the twelve step program. During these days of great suffering, anxiety, depression, alcoholism, drug addiction and all types of cancers and afflictions, this wonderful source of inspiration and hope will surely draw those to seek healing at our Most Holy Mother's Inexhaustible Cup. I will pray each day for the healing of so many who are dear to me and for all who suffer.